Creme brulee has been one of my long-standing, hands down favorite desserts ever since I really learned how to bake. My dad loves creme brulee and as soon as I learned that it’s really not that hard to make (plus you get to use a torch! ), it was one dessert that became part of my baking wheelhouse. I mean, who can resist a creamy vanilla custard base with a fun crunchy sugar topping? Now, why it took me THIS long to make a vegan creme brulee, I don’t know, but I’m glad I finally did! Turns out, putting a gingerbread twist on this classic dessert is pretty easy and delicious, especially if you’re going for an above average holiday treat. I knew I wanted to make something a little different for the holiday season, especially since cookies are where it’s at right now and no one can seem to give desserts away fast enough. So vegan creme brulee seemed like something perfect for a smaller holiday gathering. 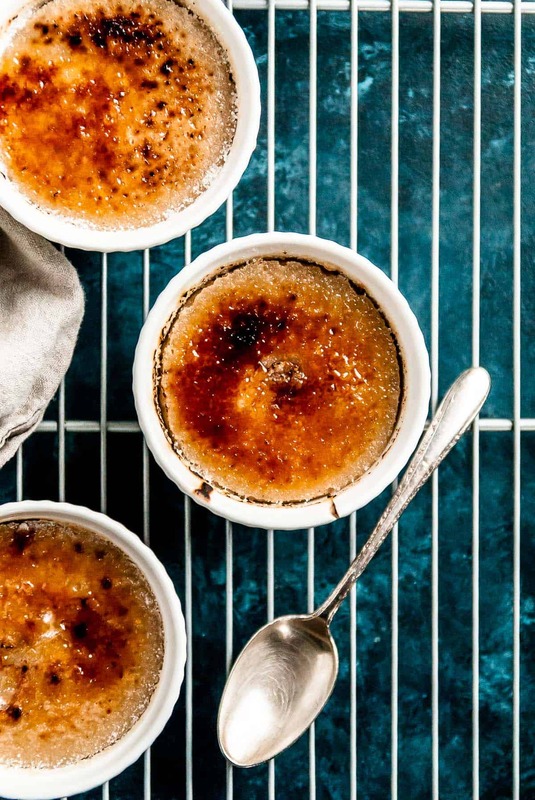 In my family, it’s just the three of us plus my husband when we get together to celebrate, so I am 100% making this gingerbread vanilla creme brulee and bringing it to our holiday dinner. The best part is that I can prep and chill the vegan creme brulee at home, take with me to my parent’s house, and torch it right before serving! A base of raw cashews and full fat coconut milk make for the perfect, creamy base of this vegan creme brulee, along with a healthy dose of ginger and a spoonful of vanilla paste. Vanilla paste makes adding a punch of vanilla flavor so much easier since it’s a lot more vanilla-y than vanilla extract and takes away the hassle of scraping a vanilla bean. 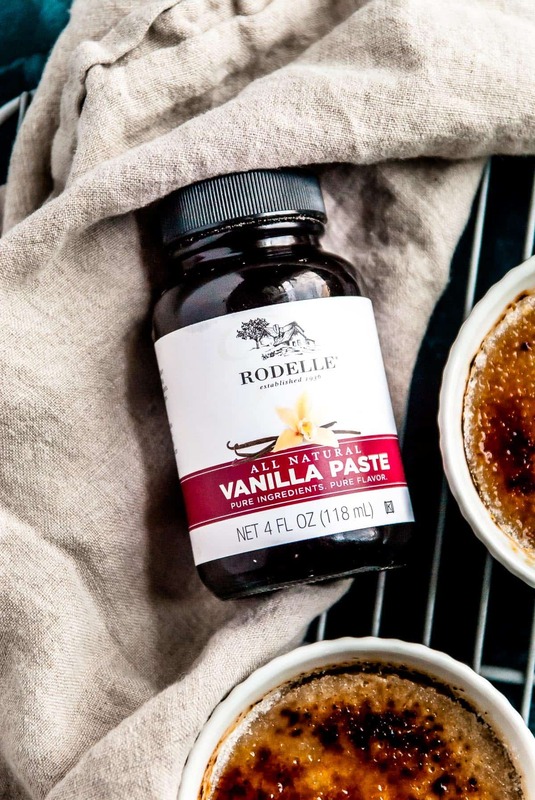 I LOVE Rodelle’s Vanilla paste since it’s the best around/highest quality and lasts me pretty much forever. 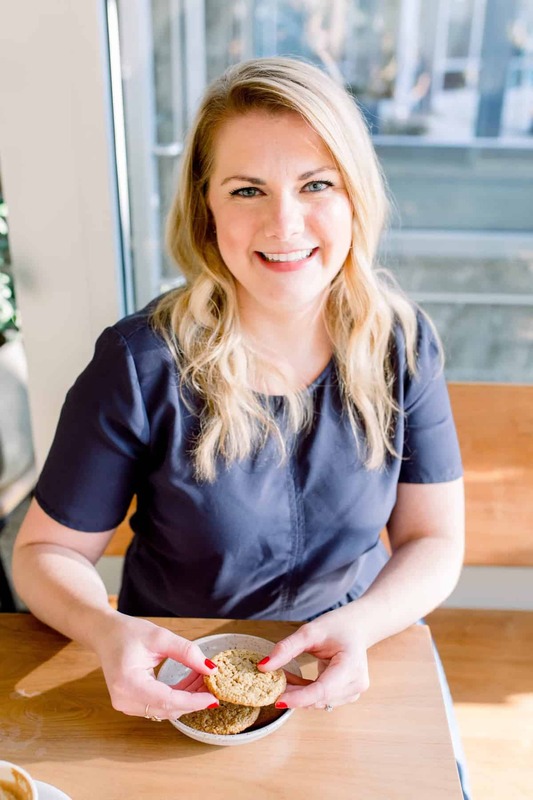 I know that tackling vegan creme brulee can be daunting if you haven’t done much baking, so I’ve popped some of my best tips and tricks for making the perfect creme brulee every time below. Don’t skip the water bath! During the baking process, you are going to fill the dish and place your ramekins in a water bath, don’t skip this! This helps the creme brulees cook evenly and steam in the oven. Brulees are meant to be cooked gently, so this just further helps the process and ensures they don’t get scorched or overcooked on the sides. Keep an eye on the mixture on the stovetop. During one of my trail runs of this vegan creme brulee I overcooked the mixture on the stovetop and it was BAD. Came out broken and grainy and everything you don’t want in a vanilla creme brulee. Keep an eye on it and take it off the heat as soon as it starts to thicken! Blend the mixture completeley. If you have a high powered blender this will be no problem, but if you don’t it’s going to take a few minutes. Be patient and blend until it’s completley smooth. 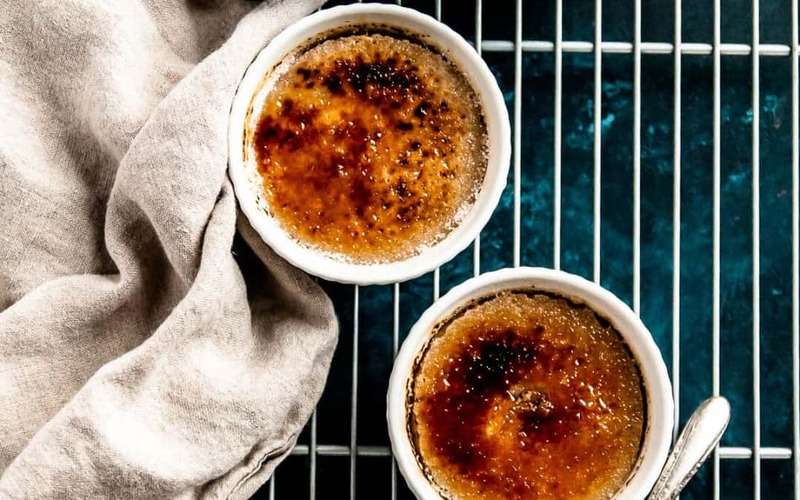 Originally, creme brulee is made from a base of heavy cream and eggs, so there should be no grainy parts or cashews pieces. Watch your torch! It’s going to be tempting to put the torch on high and just blast away at the sugar topping, but don’t! Keep the flame moving and use patience when doing the crunchy sugat topping. Otherwise, you’re going to end up with overcooked parts of the brulee and a quickly burning topping. Preheat oven to 300ºF. Grease 4 3/4 cup ramekins or brulee dishes and set aside. In a blender, combine the coconut milk, sugar, brown sugar, raw cashews, cornstarch, vanilla paste, ginger, and maple syrup. Blend until smooth and cashews are completely blended into the mixture. Heat a saucepan over medium heat and transfer the creme brulee mixture to the pan. Whisk constantly, heating for about 2-3 minutes, or until mixture starts to thicken just slightly. Pour creme brulee mixture into the prepared ramekins, dividing the mixture evenly. Place ramekins in a shallow dish (I use an 8×8 pan) and fill the dish with water until it reaches halfway up the ramekins. Bake for 35-40 minutes, until creme brulees jiggle slightly when moved. After brulees have cooked, chill for at least 3 hours or up to overnight. 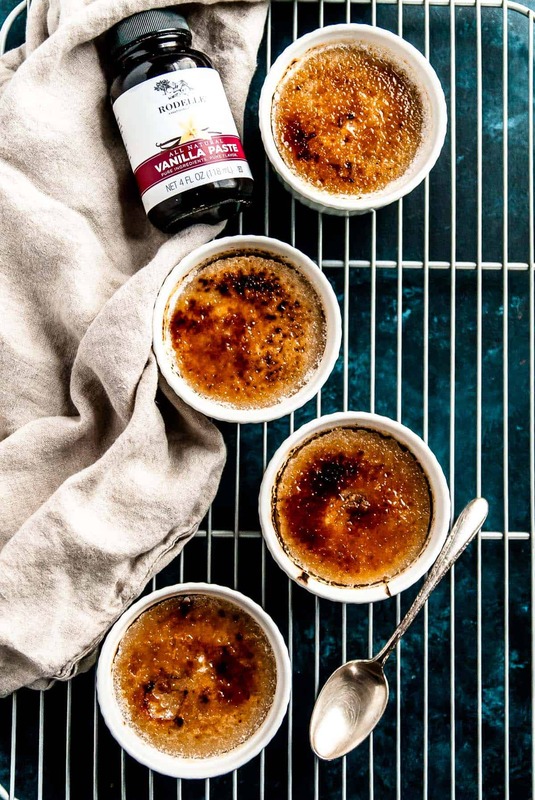 When ready to be served, sprinkle each creme brulee with a layer of sugar about 1/8 inch thick and caramelize with a kitchen torch, moving the flame quickly until sugar is caramelized. Serve immediately. What a great product and OMG the end result looks AMAZING! I can almost smell it thru the screen! It looks yummy Abby, can’t wait to try. Thanks for sharing this recipe. This is awesome!!! And I love the gingerbread twist. I bet your family is so excited to have this at your holiday dinner. This looks amazing! So glad I stumbled across your site today. Can’t wait to give this a try. How vanilla extract would you recommend, if I can’t find vanilla paste? Thanks! Made this for Christmas Eve and it was a hit! The ginger flavor is perfection – subtle and just right. Thanks so much for this recipe! 5 stars.